When trying to select and set a built-in included Windows DreamScene content video clip as desktop background, or have downloaded and installed custom third-party DreamScene animated motion backgrounds, and want to run the new video scene as the DreamScene desktop wallpaper, the DreamScene background may goes off and appears as a black screen or blank screen. The symptom may happen on first installation of DreamScene in Windows Vista, or DreamScene has been working fine previously, but suddenly the DreamScene desktop background display black video. DreamScene video black screen error normally only happen video clip contents in .MPG format (DreamScene supports MPEG and WMV formats). The interesting and annoying part is that when the DreamScene video contents are open in any media player, including the Windows Vista de facto player Windows Media Player (WMP 11), the video clip playbacks and works without any problem. Only when the video is set as DreamScene background that users will get garbage on screen and see black desktop background. If you pretty sure that you’re using Windows Vista Ultimate edition (only Ultimate edition supports DreamScene, or else go for DreamScene alternative with third-party players), has turned on and enabled Windows Aero Glass theme, and the graphics card (GPU unit) fulfills minimum specification requirements to run DreamScene, and the DreamScene still not working properly with blank background or black screen error, the reason is probably due to MPEG video decoder, especially MPEG2 codec which many .MPG DreamScene file encoded in to ensure high resolution DVD quality movie details. In DreamScene case, the MPEG-2 codec may be uninstalled, corrupted, messed up or the setting has failed to recognize any default decoder to MPEG1 or MPEG2 format used in DreamScene contents. Windows Vista Ultimate has built-in Microsoft MPEG-2 Video Decoder which should allows smooth playback of all DVDs and DreamScene video contents. However, when you install any third-party codec or codec pack, normally the codecs that are installed will take precedence and will be used to decode video contents instead of default one. So the DreamScene problem normally happens when you install program that comes with codecs of its own, especially codecpacks such as Vista Codec Package, which do tweak and adjustment to codec settings and may cause codec missing or corrupted, or the installer removes the original configuration for format decoder but fails to configure the default decoder for MPEG2 format properly. The solution is to make sure there is valid decoder codec for MPEG-1 and MPEG-2 video format in the Windows Vista system. 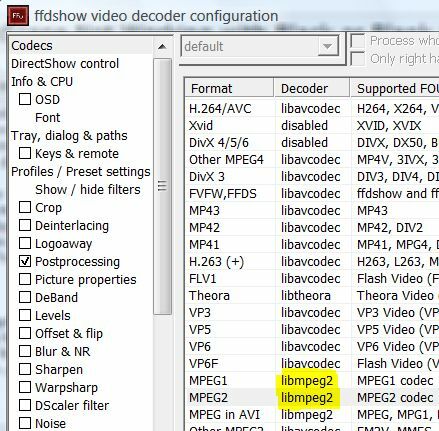 If you install Vista Codec Package (probably the main culprit to cause DreamScene black background problem), try to set the default decoder for MPEG1 and MPEG2 to libavcodec (supported by FFDShow) or libmpeg2. To do so, run Video decoder configuration to configure FFDShow parameters, a DirectShow filter used by majority of codec packs to decompress various video formats, under 32bit Tools in VistaCodecs folder in Start menu. If you download and install other codec pack such as Nimo Codec Pack, K-Lite Codec Pack, K-Lite Mega Codec Pack, XP Codec Pack, Codec Pack All in 1, Matroska Pack, Satsuki Decoder Pack and Lazy Man’s MKV Pack, check whether it comes with any configuration utility or tweak tool that allows you to manage DirectShow filters or other codecs’ settings to ensure MPEG-2 is assigned to a proper decoder. An alternative solution is by reinstalling legitimate program that has its own MPEG decoder, i.e. DVD authoring, burning or movie creating software such as Nero, and DVD player such a PowerDVD and WinDVD. Last possible workaround is to convert (tips: various video converters) the Dreamscene MPG files into WMV files, and then place the converted videos back into the default DreamScene contents directory at C:\Windows\Web\Windows DreamScene folder, or drag and down them into Windows DreamScene Content location in Desktop Background dialog. The trick will allow .WMV contents to available for selection to set as DreamScene background, and will play at your desktop background nicely.